I wouldn't say I'm breaking the rules of my own website, but I'm going to bend them here a little bit. When I write about a record, I only write about new records that I've bought recently. I don't go diving into the archives because I'm not really documenting my entire collection, only the new things I am adding to it. 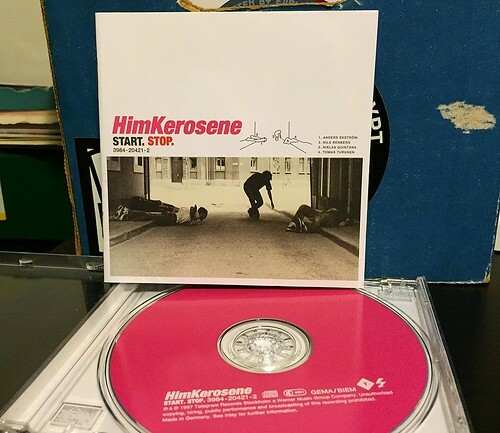 I've had a copy of this Him Kerosene album since the late 90's, so it's not really new. But I just bought a second copy. I'll use that as an excuse to write about this record because more people deserve to hear it. Start. Stop. is one of my top ten favorite records of all time. I've said numerous times that I think Him Kerosene are the most under appreciated band that have ever walked the planet. In a perfect world, they would have been one of the most famous bands there was, but they just ended up being something of an obscurity. This album was released on Telegram records, a subsidiary of Warner in Sweden. From what I can gather, it was released and then quietly faded away. I'm not sure if it ended up being the equivalent of a Fig Dish caliber used bin band over in Sweden, but these CD's didn't really make it to America. I received my original copy from Magnus, the drummer from the band Starmarket and the guy who ran a record label called Chalk Sounds for a while. I have just cherished this record ever since. I never see copies come up, so when one recently appeared on Discogs from a seller in France, I grabbed it. That's how important this record is to me, I just felt that I had to have a back up copy in case something ever happened to my original. The music on this little silver disc is some of the best I have ever heard. Giant, dynamic, insane guitar work highlights Him Kerosene. They have an incredible way of weaving a tapestry of noisy riffs out of two amazingly talented guitarists. The rhythm section is a powerful force, keeping the band grounded while the guitar chaos is swirling around them. In that regard I see some similarities to how The Pixies operated, but I wouldn't say the two bands sound alike. The vocals on this album are what elevate it to the highs it reaches. Niklas Quintana's higher pitched, pissed-off-Doug-Martsch sounding voice, layered on top of this storm of music is simply a perfect combination. Just listen to a few moments of "Untied" or "Neutrino" or "Whatever Gets You By." Start. Stop. is an absolute classic. It is one of the best records ever released in the history of mankind and it is the number one record that I'm begging someone, anyone to rerelease on vinyl. It deserves so much more than to just be a forgotten album, hiding in a used CD section in some forgotten record store in Europe. This is an album that should be celebrated. In a tragic turn of events, I can't find most of the songs on this album streaming anywhere online. Only "Whatever Gets You By." It's a tremendous song, but I don't think it is representative of the fast paced energy of the rest of the album. It's the song that is closest to being this album's ballad, if you could use that word to describe any song on this record. It does look like the album is available on iTunes and some other online download services, so if you can't find a copy of the record anywhere, it's certainly worth a download. You wouldn't find me willing to pay for an electronic version of an album often, but this is one time that I would if there were no other option. I'd love to get my hands on a physical copy of this album. And since you mentioned Chalk Sounds, I'll add that I'd also love to get a copy of The End Will Be Kicks - TEWBK, too.